It is a Black and White Small Printed Hat with beautiful Red Rose in the front.It can go perfectly with any costume. Clip On Glitter Top Hat.Includes: Rose clip-on petite glitter top hat with polka dot mesh and feather.Available Size: One Size Fits Most Adults and Teens. *Costume and Accessories Not Included. Sold Separately. 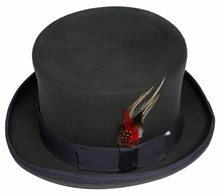 Wool Felt Top Hat Adult.Includes: One Wool Felt Top Hat Adult. Available Size: One Size Fits Most Adults. *Costume and Accessories Not Included. Sold Separately. 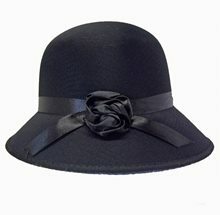 Black wool felt top hat, suitable for men or gothic women. Women can dress their hats in a more feminine way by tying a simple black scarf or net around them, in Victorian riding hat style. 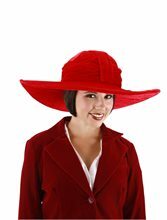 This gorgeous wool top hat is beautifully lined in wine satin. 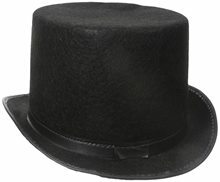 A wool top hat is also perfect for the groom's party at your gothic wedding. Beautiful gothic or Steam punk formal wear.